Click on the links below to see UCAN Members perform a Flash Mob dance on U-Tube. Over 40 UCAN Productions members, who are all visually impaired, helped the Big Lottery launch their new ‘Bright New Futures’ programme in the Wales Millennium Centre, Cardiff Bay. 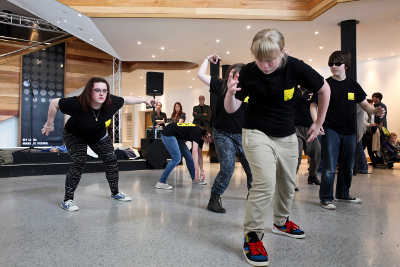 UCAN members from all over Wales took part and surprised the public in the Wales Millennium Centre by bursting into dance. UCAN were happy to help the Big Lottery launch this project which aims to build the resilience of young people in Wales so that they have life skills, knowledge and the ability to manage key transitions in their lives. The Big Lottery Fund are making £12 million available for projects across Wales, working with young parents and/or young disabled people aged 14-25.